Ash goes a little mad sometimes. 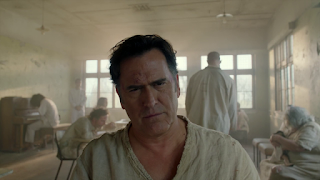 But wait, maybe Ash has been locked up in an asylum for the last thirty years. Maybe he did have a psychotic break while staying in that cabin, and all the supernatural things we've seen him experience over the course of the original trilogy and this TV series have simply been the delusions of a madman. That's a question director Mark Beesley (who also directed the previous episode, 'Trapped Inside') and writer Hank Chilton, who has written for such shows as Nip/Tuck and Covert Affairs, do attempt to put in Ash's mind during this episode, and maybe it will get some viewers to entertain the possibility that Ash could be insane as well. Maybe there's a bit of a Phantasm-esque twist going on here... It could be something interesting to explore, but it never made me wonder if Ash really is a mental patient. It's pretty clear that this is just a mind trick the demon Baal (Joel Tobeck) is pulling on Ash - even going so far as to appear within this scenario as Ash's psychiatrist. It's all very Wizard of Oz in that aspect. 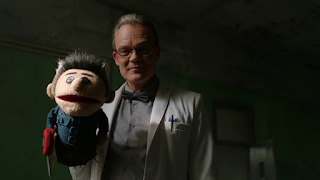 Baal is there as the doctor, who is trying to help Ash out with a puppet made in his image. And some shock treatment. Ruby (Lucy Lawless) is a nurse who considers Ash to be a murdering pervert. Pablo (Ray Santiago) is a rough orderly. Chet (Ted Raimi) and Kelly (Dana DeLorenzo) are fellow patients. Ash's childhood sweetheart Linda (Michelle Hurd) stops by. 'Delusion' is an interesting chapter in this story; not quite as fun as the typical episode - it has a darker, stranger edge to it than Ash vs. 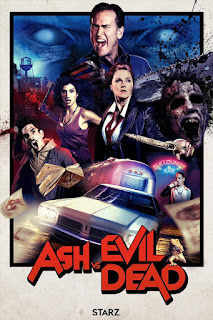 Evil Dead tends to have - but it's enjoyable to see the show try a little something different. It's good to switch things up now and then, as long as we circle back to status quo after getting experimental. I assume we'll be out of the asylum in the next episode, and Chilton's script leaves Ash in a different mind set than we usually see him in. Baal has put ideas in his head, has given him a mission, and I'm intrigued to see how Ash will proceed from here. Now more than two-thirds into this season and with just three episodes left, we're entering the home stretch.